All areas of the sky observed by SCUBA-2 on the JCMT. This includes legacy survey fields as well as publicly available data (as of 2014). The JCMT Science Archive at the CADC contains all raw and processed data from our current instrumentation. You can search for data by a large number of options, including position on sky, frequency range, time the observation was taken etc. Please see our guide to the JSA for more information on how to search the archive, or for more overview and history of the JSA please see Economou et al 2015, “Observatory/data centre partnerships and the VO-centric archive: The JCMT Science Archive experience” (also available on the arXiv). All observations taken with our current instrumentation and containing scientifically useful data (e.g. not an observation of the dome or similar) are available to search and download through the CADC. Usually, both the raw and the pipeline-processed data files are available within a day or two of the observation being taken. Occasionally issues with the transfer of files between JCMT and CADC can extend this time frame, but rarely by more than a day or two. Publicly available raw and processed JCMT data is visible to all users, and can be searched and downloaded without a CADC login. Calibration observations are always publicly available. Most engineering observations are never made public. Most observations have a proprietary period of one year from the end of the semester they were observed in. Proprietary observations are only available to the PI/CoIs of the project or their nominated users. Proprietary data for your projects will only be shown if your CADC login has been associated with your JCMT OMP ID. This can be done by your friend of project.Your friend of project can be found on the time allocation page. On 4th September 2015, the JCMT Legacy Release 1 (850um) was made public. This data set contains standardised reductions, coadds and emission catalogues of public 850um SCUBA-2 observations taken before 2013-08-1. For more information, please see our web page on the release. All JCMT observations taken with SCUBA-2 and with HARP-ACSIS, RxA3-ACSIS and RxW-ACSIS are fully integrated into the CADC archive and are searchable. SCUBA observations are available but can currently only be searched by date; they will be fully included in the future. Pre-ACSIS spectral observations and older continuum observations are not yet fully available through this interface. FTS2-SCUBA-2 (with the Fourier Transform Spectrometer in the beam — still being commissioned). All of the current heterodyne instrumentation uses the ACSIS backend, so the raw data from all of these receivers is in the same format. Polarimeter observations are indicated by having the word ‘POL’ in front of the instrument name at CADC (e.g. POL-HARP-ACSIS). Please note that are occasions were non-polarimeter observations have errors in their metadata which results in the instrument name at CADC having a POL prefix when no polarimter was used. Please contact us if you have questions about these observations, or if you notice errors in the metadata. Observations taken with all our older observations are also present at CADC. Older instrumentation may have missing observations, or may unfortunately be lacking in metadata, due to a rather hurried required change in 2014 to CADC’s new data model. If you require access to observations from these instruments for a science project and cannot find enough information in the archive, we would suggest you contact us and we will endevour to help you as available effort allows. In general, most JCMT observations from retired receivers will have incomplete metadata. Generally, they will have the correct observation date, the correct source name, proposal ID and a useful list of other settings in the ‘instrument keywords’ column. They will often have almost no other meta data — notably the frequency information and the RA-Dec polygons are usually not present, so most of CADCs search tools will not be useful for these observations. The DAS data which has been converted into ACSIS format are an exception, and these observations should have the same metadata available as for our current observations. These observations are listed under the names <receivername>-DAS (e.g., RXA3-DAS). Please let us know if you encounter any issues with these observations. 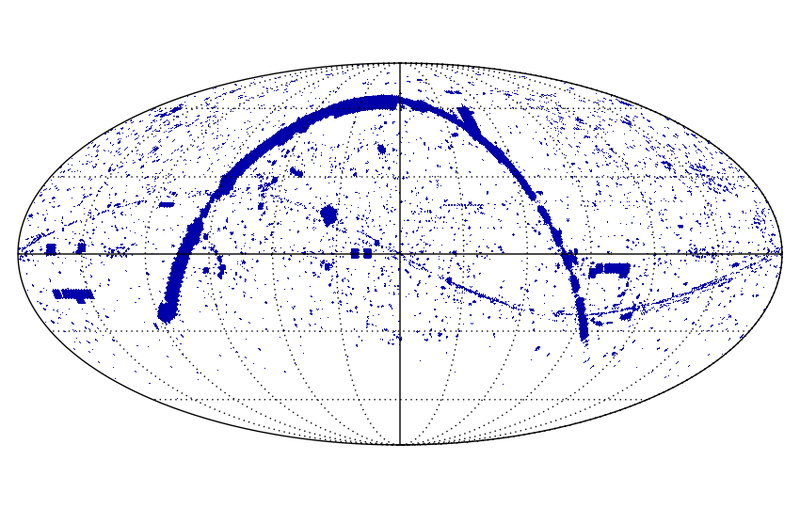 While our current instrument naming scheme is ‘FRONTEND-BACKEND’, a large number of the oldest observations are shown under just the backend or just the frontend name. To see more details about an observation, we recommend displaying the ‘instrument keywords’ column in the search results at CADC. The following table shows all the non-current instrument names shown at CADC, along with a brief explanation of what sort of observation is shown under that name and what time range they cover. C band receiver with the DAS spectral backend. D band receiver with the DAS spectral backend. A continuum array receiver used from 1997 to 2005. A single pixel continuum bolometer used from 1989 to 1997. *: these raw observations have been converted to the same instrumental format as is used by our current ACSIS spectrometer for ease of reduction. For more information on any of our retired spectral front end receivers, please see the retired heterodyne receivers page. All observations from our current instrumentation which contain astronomical data are reduced by the JCMT using our standard pipelines. On a nightly basis, we reduce all the observations using whichever standard pipeline recipe was chosen by the PI. In addition, PI’s can request additional configuration parameters which are then used for these nightly reductions of their observations. All repeats of the same observation from the same night are coadded or co-reduced together to produce a ‘nightly’ product. Both the reductions of the individual observations, and the nightly coadded products, are uploaded to CADC (usually the day after the observation was taken). These files are available to search and download with the same proprietary rules as the raw observation. In addition, we have recently been reducing our publicly available observations using a standardised reduction pipeline chosen to work reasonably well for all our data and science aims (instead of being tweaked for single option). These reductions of individual observations, as well as the coadds and catalogs of the detected emission, will be publicly released in July 2015. The quality of our data reduction pipelines has been greatly improved over the years. We endeavour to always keep the best available reduction at CADC. As a result, there is some variation in the quality of reduction. We are currently engaged in re-reducing our older observations with our modern pipeline, so the quality of the publicly available reduced data is always being improved. Our aim is to provide users with as scientifically useful data sets as we can manage. To that end, if you feel our reduction of your observations could be improved, please discuss possible configuration improvements with your Friend of Project. Principle Investigators and co-Investigators of JCMT observing projects can access their data from the OMP using their project code. Comments on the project, observation logs for the nights, and the observing history for the MSBs are also available here. If you’re downloading raw ACSIS or SCUBA-2 data to reduce yourself, don’t forget to check out the data reduction (DR) information in the Heterodyne Data Reduction Cookbook (also available in PDF) or the SCUBA-2 Data Analysis Cookbook (also available in PDF). Starlink reduction and analysis software is available through http://starlink.eao.hawaii.edu. The link to the JSA given on this page goes through a JCMT-specific landing page; the direct link to the search interface for all telescopes is here. If you encounter problems when using the JSA, please report them here.